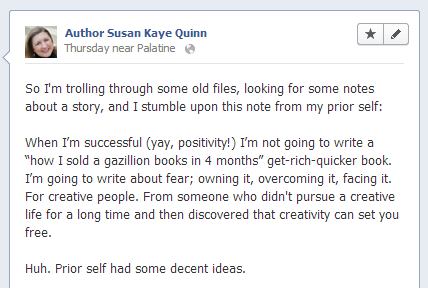 I believe that overcoming fear is one of the most difficult things a writer does. Maybe this isn’t true for every writer, but it was is certainly true for me. In the beginning, it was fear of sharing my work, fear of leaving behind “real” work for “creative” work, fear of failure. Later, it was fear of success (and the expectations that come with it), fear of not being able to repeat what I’d already done, fear of being “found out” as not a “real” writer. Later still, it was more fear of failure, fear that this writing thing might consume the other important things in my life, fear that the emotional part of myself that was unleashed might consume me in a different way. As I go along the journey, the fears are still there, just transformed. Eventually (because I can be an excessively slow learner), I realized that fear is an essential part of writing. In a way, you should be seeking out that which you fear, because there lies your greatest hope for progress as a writer. But this only works if you can manage the fear: admit it, name it, and take action in the face of it. Between drafts of any work, I like to purge my mind by working on something else. So, when I sent off Draft Two of Free Souls to my critique partners, I decided to outline the next series I’m going to write. It’s been rambling in my head for some time, so I was primed and ready to dive in! And I was excited – new stuff! Bring on the shiny! It seems the fear always strikes, ninja-like, when I least expect it. This new series was about a science-fictiony topic that was BADASS COMPLICATED. Serious brainiacs around the world basically shrugged and said, “This is way beyond our understanding.” It wasn’t like I had to pass a Ph.D. exam in the subject – it was much worse than that. I had to take the stuff that was already known and project it into the future to create more advanced stuff that hadn’t happened yet. And, by the way, it all had to make sense and some of the people who could give a Ph.D. exam in it might actually read my work. Oh, and it had to be good fiction too. What are you thinking? the Fear of Failure asked me. That you can really pull that off? So, I took that Fear and my library card and checked out a stack of books from the library. I haven’t even read the books yet, but the Fear of Failure has already slunk into the corner and started playing with the cat instead. Then I started outlining the series, and my heavens, there was a lot of material to mine for this story. My subconscious had been tossing this around for the last year, and it was gushing ideas. The series quickly looked like six or seven novels, not a trilogy, and not six or seven short novels, but six or seven full-sized novels. Who are you, JK Rowling? the Fear of Consumption mocked me. Seven novels? You don’t know how to do that. Besides, you’ll get bored long before it’s done, and then where will you be? Maybe the first book of this next series will be so badass complicated that I’ll never finish it. Or maybe the series will wander into the hinterlands after book 2, or sales will tank, or I’ll get bored and stop writing it. But as I scribble madly on small squares of paper and outline and drink more tea, I realize that none of that matters. The act of creation is here-and-now and this, THIS, is what I love. Not only the act itself, but the more I outline/write, the more I love this particular story, which tells me I’m working on the right thing. That it summoned my fears only tells me that I’m on to something worth tackling, no matter what comes of it later. For me, Creative Action buries those Fears in an avalanche of Inspiration. How do you tackle your fears? Fear can be the blinders that keeps us from reaching our goals. And the funny thing about fear…we control the power it has over us. So much wisdom here, Susan. I found it especially helpful to hear that seeking what we fear leads to creative progress, and that working on something worth tackling will summon fear, but that's only an indicator of its worth. Thanks for sharing! I'm so glad it helps! Some of these are hard-won lessons for me. Fear hounds me through each first draft. I don't know how to deal with it other than borrow others' belief in my ability and rest in the uncertainty, knowing things always feel this way and will eventually even out. Have you read ART AND FEAR? I haven't yet, but it's sitting on my shelf. Darcy Pattison read a portion aloud during her revision retreat I attended in 2009. It's very powerful. My current fear, having just published my first book, is that no one will read me, no one will find my work. Of course the antidote to that is to plow through my fear to reach out to find my readers, in little ways every day. What is the old book title that is so apt? "Feel the Fear and do it Anyway?" Something like that. I find it's not just a matter of bulling through, though. The other important element is to actually recognize and own the fear, as you mentioned in your Facebook post. And seek to resolve the fear by looking for its underlying causes. Otherwise isn't it like continuing to drag balls and chains — one eventually can run out of strength. Anyway, some musings for a Monday, and thanks for raising the subject! Owning the fear, looking it in the face and naming it – you are right that these are key parts. Ignoring the fear (and plowing through) is more like denial, which can help sometimes, but mostly will wear you down (as you say) and end you up in a ditch as you blindly trudge forward. Better to have your eyes wide open and staring fear straight in the face…then stepping past because you have fixed your sight on a larger prize. As for fears about that first book, keep your eyes on the longer range goal. It's not all about this ONE book, it's about building a career as a writer (assuming that's your goal). I know so many indie authors who were unsuccessful with their first book/series, but the second one shot to the top of the charts. Different genre/different story/more growth as a writer – who knows why – but it's part of being a writer, not just having written a single novel. Thanks, Susan. And yes, I am building this as my career. I'm starting my next novel this month, fear or no fear. Good luck with your new series, by the way. Sounds ambitious but awesome! I kick fear in the teeth and get on with my day. How do I face my fears? But your way sounds good, too. So true. If I fear writing a book b/c I'm not good enough yet, I know that is the book I should write. So inspiring, Susan! I love that you tackle fear by keeping on keeping on. I need to internalize this message. There are a couple of projects I'd love to tackle, but am afraid I'm less than "qualified" to tackle. As if, to write a story, one must have lived it first! I think the world of fiction would be extremely boring if every writer waited till he or she was qualified to write about a topic. 🙂 Thank you, as always! I like Matt's answer! That's what I do too. I have no fear in the planning and outlining stages. I like that part. My fear usually comes about half-way through the process. I've learned to cope with that fear by stepping away from the writing for a few days, and letting ideas brew. And, Susan, if a rocket scientist can't totally dispell that fear, is there any hope for the rest of us? I love the coffee table pic! I can't wait to hear more about this next series! I often feel overwhelmed with the fears – but I am getting better about it all! One step at a time! When I'm writing, I start with the part that doesn't scare me. Maybe the intergalactic politics is too daunting at the moment, so I write the quirky meeting between the MC and his sidekick. Or the fight scene isn't turning out right so I research courtly dances of the 14th century. Once I get started with the easy stuff, the excitement of the project gives me momentum to jump over to the hard enough. It seems much more approachable (and less scary). My friend calls it the snowball effect. You start rolling a little snowball down the hill, and it gets bigger and bigger until it plows over everything in its path. Even Fear. I like it! Momentum is not to be underrated. The scary parts are the most challenging, and I always like a challenge. I think those are the interesting parts, where you can push yourself, where you can explore and find something new: about writing, about the world around you, or about yourself. Lots of great comments about fear. 'No Fear can withstand the power of the cork board. :)' LOL!!! This post is so true in so many ways. I also struggle with fears on many levels when it comes to my writing, but am learning to chase the things I really love. By the way it's amazing your new idea is sparking such creativity – I'd definitely send that fear into time out and enjoy the process!!! I read ebooks almost exclusively. The pricing is generally more affordable and as I am such a voracious reader this is my lifeline 🙂 Thank you for being one of the awesome writers I have been able to enjoy and I certainly hope to continue the journey with you. I read ebooks and anything else that stands still long enough. It's a funny thing about fear. We can let it hold us back or push us forward. My husband said the reason it took me so long to begin writing my first book was because I was afraid I would have to talk to people. I looked at him, cried because I knew he had seen into my deepest soul and then picked up the pen and began. I am not able to make a living at writing yet. However, I fulfilled the request by a student to write books that they would like to read. Thanks for the constant encouragement. Yes. I read them on my computer. Thanks so much for the chance to win! This is my favorite line in a fabulous post: That it summoned my fears only tells me that I'm on to something worth tackling, no matter what comes of it later.